Why do we say that strategic donor (‘major donor’) programmes take eighteen months to break even? It’s a number I have heard again and again, and that I repeat when I am teaching strategy at the Postgraduate in fundraising at the University of Barcelona, without having hard data to back up the claim. To find an answer, I have been experimenting on myself. Since January 2017 I have been working a few days a week with Pallapupas, the healthcare clown organisation in Catalonia. I’m their strategic donor fundraiser. I thought, with the arrogance of years of experience as a consultant and researcher, that – ha! – this was going to be easy. In six months, I thought, we’ll fix this and I can sit back and watch the money roll in. And here we are, almost eighteen months later and now, after a lot of blood, sweat and tears, now we can see the money starting to roll in. Fundraising shines a bright light on your own character. So I have learned, in the last 18 months, that I am no blooming good at cold calling by phone (OK, I am doing it in my second language, but that’s no excuse); that I really enjoy building networks of people and sometimes focus more on that than on the money; and that I develop relationships with people over time, not at speed. All of these factors help explain why it takes me time to reach breakeven. But this is not some embarrassing confessional. I’m illustrating the point that each of us who takes on a strategic fundraising role brings our character to play – and that affects how long it takes to reach the moment when the programme is up and running. So the first challenge for the new strategic donor fundraiser is how to build a case for €10,000, or €100,000, or €10m. That is an enormous leap for many organisations. Some of them back out, building middle donor programmes with asks in the hundreds, not the thousands of Euros. Making the case means putting together a budget, making a business plan, winning buy-in from colleagues and key staff, and producing a convincing elevator pitch. All of which takes time…and more, if you hit problems with the Project Pipeline, or the words. Does the organisation have €100,000 projects? Or €10m projects? Or dreams at these levels of funding? For many organisations this is a challenge. The project pipeline does not exist – there is no ‘deal flow’ in investment terms – so there is nothing for the fundraiser to propose to her prospects. Sometimes, in large, complex organisations, you can see the projects but they are distant and hazy, and there are 30 layers of stakeholders between you, the fundraiser, and the project. You know it is going to take an age to cut through the jungle. Even when you can see the projects, you need permission to use them. In some organisations this can take a long time. In others, it’s a race to own a project before another colleague grabs it to pitch to her favourite donor. Your choice of words is sensitive, and more so when you are working with strategic donors because you will be working alongside the board and the director, both highly tuned to the right words. Eighteen months in, and I am still learning how to paraphrase the mix of culture, theatre, humour and hospitalised kids that typifies clowns in healthcare. Too many organisations in Europe have too little data. We know so little about our donors. Yes, data protection and privacy are key issues, but your local supermarket knows more about you, your interests, your attitudes and your wealth than the biggest organisation that you donate to. Many organisations don’t know what jobs their donors do, what age they are, or anything about their family situation. Without this data we are working in the dark. Compare this to the private banks, who are increasingly entering the HNWI and UHNWI area to offer philanthropic services. I spoke with the head of philanthropy at a leading private bank (50,000 clients, 500 account managers) a few weeks ago; he told me that because he can see the banking account details of his clients he knows exactly which charities they are giving to, and can work out which causes the client is interested in. He can offer philanthropic services (including channelling money via the bank’s own foundation) precisely tailored to that client’s needs. Because they have too little data, many organisations have to focus on the tiny handful of prospects whom they know directly, via personal contacts. So instead of broadening their strategic donor programme to reach the hundreds of existing donors who have the money, they rely on the tiny inner circle. That means lower productivity, a limited focus, and slow programme growth – because growth is organic, person-to-person. Our systems don’t just slow us up, they can clog us up. A simple system problem – when, for example, the donor database does not talk to the accounts system, or where the two use a slightly different coding system – can mean that we have to manually re-enter data. Or it can mean that searches for a donor’s history are a headache. Sometimes it is the thank-you system. I have worked with organisations that have an automated process for sending out thank-yous of the ‘Dear Sir/Madam Thank you for your gift of €xxxx [fill in number]…’ type. So Madame LaRiche, who has just sent you half a million, gets a ‘Dear Sir/Madam…’ letter and there is nothing you can do to stop it. It takes time to persuade the I.T. team to change their ways. These are stupid niggles in the system. But they slow us down. Or more likely, catch us out just when we think we have a programme ready to go. You have produced the case, sharpened your elevator pitch, identified potential donors and built a workplan. But you need the leadership to be engaged if this is going to work. You need their buy-in because you want to work with them and their contacts, but also because you and they are going to have to take some tough decisions (this ALWAYS happens with strategic donor programmes); should we work with that potential donor? What do we do when a prospect offers us a lot of money…to do the project he wants, not the one we want? “Bring in leadership from the start.” Yes, that is what the textbooks say. But making that happen in real, busy lives where people have a load of other priorities, takes time. This is going to happen after you win the new donations and partnerships. But you simply have to get this sorted out before you meet your first prospect. Bench-test the process with your colleagues so that you understand every potential glitch on the way. Your donors and partners want to see the numbers, the stories, the videos and the pictures of ‘their’ project. So if that information is going to be hard to collect because your field office is hard to reach, because you need special permission to use this or that photo, or because the impact report is still being compiled, then either find alternatives, or wait until the material is sorted out. Because you need to get all of this moving at the same time, involving players right across your organisation, from the chair of the board to the lab technician or assistant field worker. In amongst all of these threads of action is a critical path, the line you must follow in order to achieve your goal. But when you are new to the organisation, you simply cannot know where that path lies, nor where the potholes are that are going to slow you down. You have to learn, to listen, to find all this out. And that takes time. None of this is the market, or the culture of philanthropy – the reasons most commonly cited for the time it takes to get a programme to maturity. These are all internal reasons – stuff inside the organisation, combined with your own character traits, that limit your speed of action. Are there shortcuts? Could we be working faster? In hindsight, you can see that there are. But the problem is that you can’t get to the hindsight until you have put time behind you. Getting leadership onside early certainly speeds up the process, in part because it opens doors to stakeholders in technical, financial and communications departments. Quick work with the case – especially, building and testing case documents internally to get buy-in – is also a help. But neither of these routes is going to shave a lot off your timescale. So I have learned to set expectations, right from the start. To say ‘eighteen months’ in the knowledge that that is how long it will probably take, but also in the hope that the break-through will come sooner. 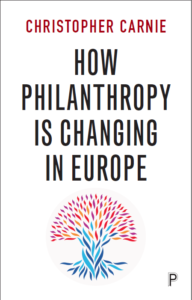 Chris Carnie is the author of ‘How Philanthropy is Changing in Europe’, published by Policy Press. Posted in Chris Carnie's BlogTagged donor programmes, fundraising, major donors, strategic donorsLeave a Comment on Why 18?